Welcome to Copper Court Casitas, a small group of completely furnished boutique short-term rental accommodations with a major focus on details. Location, location, location. The property is located one mile from Banner /UMC Hospital and a few blocks more to the main campus of the University of Arizona. We are “central” to metro Tucson and there is not much that can take more than 30 minutes to get to by car. There are a dozen restaurants and coffee shops within 2 blocks. Yoga Oasis, Albertson’s, dry cleaning and much more is within easy walking distance. Don’t care to walk? We’re on Tucson Transit Bus line. The complex is comprised of 7 apartments (Casitas) and one immediately adjacent house (Hacienda). There are five 1-bedroom Casitas (600 sf), perfect for up to 2 people, and two 2-bedroom Casitas (725 sf), perfect for up to 4 people. 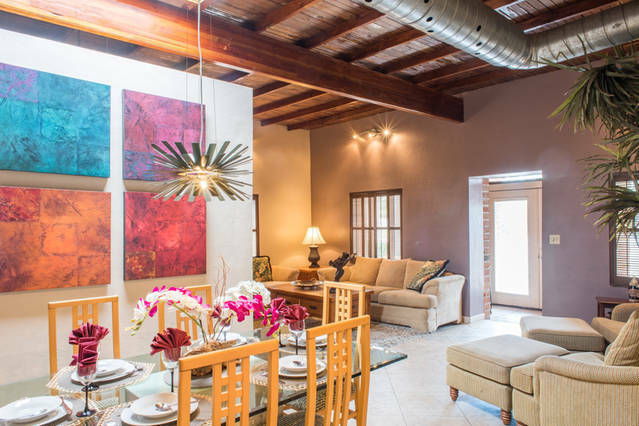 Most Casitas have a convertible sofa in the living space and may technically accommodate two additional people at $20 per person for short term visitors. The Hacienda features three bedrooms, an office, great room and large private back yard. Since conversion to short-term rentals over the past three years, our guests have included members of the cast of Phantom of the Opera, astronomers from Chile, molecular biologists from Oxford, heart transplant patients, corporate relocation clients, traveling nurses, medical students/interns/residents/fellows/faculty, US Government agency staff on temporary assignment, winter visitors escaping the snow/rain, “U of A” parents, winter visitors and bicyclists, bicyclists, bicyclists! On average the stay is for 30 days while some stay the minimum of 3 nights and others as long as 6 months. Welcome to Copper Court Casitas.